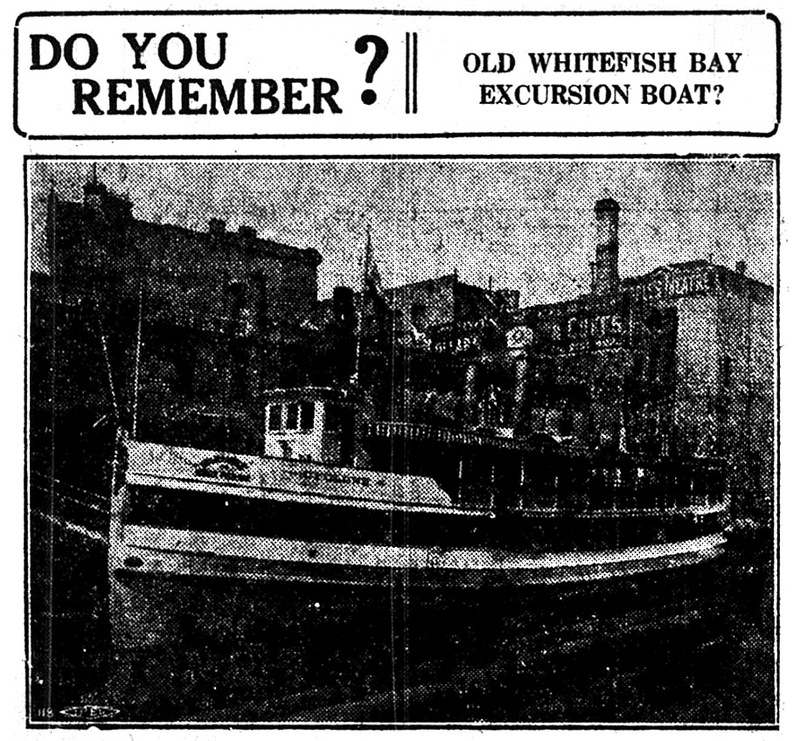 Do You Remember the Old Whitefish Bay Excursion Boat? Local writer and historian Carl Swanson wrote a history of the Whitefish Bay resort on his blog. It brought to mind this article written by Frederic Heath back in 1920 about the excursion boats that serviced the resort from downtown. Heath’s article fills in some of the details of the resort. Whitefish Bay as a resort for city-baked people seeking the cooling influence of lake, woods and grass in the good old summer time, is now merely a memory. The old steamboat pier is almost washed away, just as the old piers off Huron and other early streets also disappeared. Afternoon and night crowds flocked to the resort north of the city and from the high terrace viewed old Michigan by day, or hunted pebbles on the beach below, and at night sat at the open air tables, drank their beer, munched their caviar sandwiches, and chatted or watched the lights on steamers and schooners passing to and fro on the black waters out in the lake. It is the criticism of strangers coming to Milwaukee that our people act as though the lake were merely to be tolerated, and they wondered why excursions on the bay and to near-by points are not a part of the city’s enjoyments. This criticism would not have held good years back, for there was a Whitefish Bay boat making regular trips that was well patronized. It was 25 cents a round trip and there was always a comfortable crowd on board when the weather was at all favorable. The view given today is of the Cyclone, one of the steamers that successively handled the bay excursion business. It had its dock just north of Grand Ave. bridge, alongside the old No. 2 Grand ave., which was for many years the old Pollworth Home restaurant. The river at this point could tell many historical facts, had it the power of speech. For years and years Old Abe Muehlendyke rented rowboats at the lakeshore, off the present Juneau park. But the memory of man goes back a little further to the days when Abe’s boat livery was originally situated on the shore of the river, also near the Grand Ave. (Spring St.) bridge. It is altogether likely that the passing of Whitefish Bay can be laid to the door of the development of the city park system. Lake park, with its cool shades, its beautiful view of the lake, its accessibility and its band concerts and other attractions, became a powerful competitor to Whitefish Bay before motor vehicles became common, and even afterward they do not appear to have put the bay back into favor, as might have been expected. Whitefish Bay is getting nearer and nearer to town. A few years ago the county was offered, free of charge, a strip along the lake shore in Whitefish Bay village, just north of the turn on to the county loop (Silver Spring Rd.) for park purposes, but there were enough wise ones in the county board to block its acceptance. It was a narrow strip and the edge of the bluff was close to a Whitefish Bay street, which would have to be protected from landslides at some cost, but even so, a par at that point would have given the people access to the lake. Now the Whitefish Bay resort is gone and the public cannot reach the beach without becoming trespassers. All of which is sincerely to be regretted.